Johnny Storm, the second Human Torch, discovered Namor of Atlantis, wandering with amnesia in the Bowery. Burning away the extra hair and substantial beard Namor had grown, Johnny dropped the Atlantean into the harbor and, by returning him to the ocean, restored most of Namor's memory. 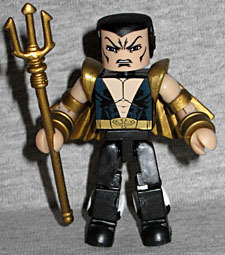 Assuming humans had destroyed Atlantis, Namor rashly invaded New York City to avenge the destruction of his homeland. He stubbornly spent the next several years warring with the surface world, most often opposed by the Fantastic Four. Namor is wearing the same costume as in the Defenders box set, but its created entirely differently. Rather than a separate sculpted vest, his vest and belt are painted on, and he has squared-off pieces around the shoulders to create the big flares there. He still gets the ankle wings, but different wristbands and golden versions of Black Bolt's wings. He's armed with a trident - a piece formerly used with the DC Minimates' Ocean Master. When Namor returned to Atlantis and found much of the civilization in ruin, he blamed the surface world. Though Namor had defended the surface world and saved it from ruin many times over, he considered his work there a mere distraction to his work in his native Atlantis. Being hot-tempered and easily excitable, Namor built an Army to have at his disposal if needed. Atlanteans are as much as ten times as strong as the average surface dweller; outfitted in armor they are certainly a formidable force. 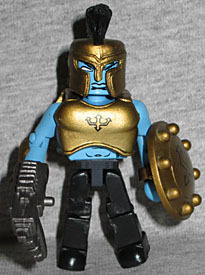 The Atlantean Soldier has pale blue skin, has black pants and is wearing gold armor: the helmet and breastplate from Ares, and the arm guards of Lady Loki. The colors make a good contrast, and there's a trident painted on the chest armor. He's armed with a shield (originally from Hawkman) and a futuristic gun. 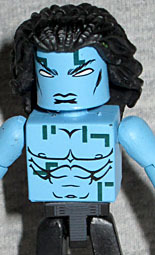 The set also includes a new hair piece, for those times you want a more casual Atlantean. The hair is done in dreadlocks, matching the way the Atlanteans looked during Civil War. The only downside is that he can't use the shield unless you take off his arm guard.